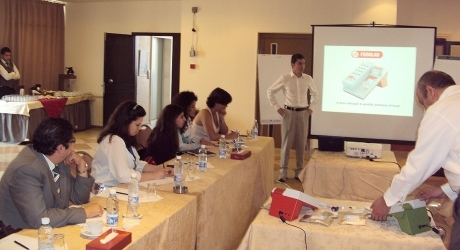 CDR FoodLab® Line, food and beverage analyzers, were presented in Beirut to a group of operators of the edible oil sector and of Lebanase food industry. The presentation was made by CDR as a result of the distribution agreement with the Lebanese company Biolab. The sales managers of CDR, Gabriele Casini, accompanied by staff of Biolab, have had the opportunity to visit local companies that produce oil, nuts, dairy products. A considerable interest was expressed for the CDR FoodLab® line especially for edible oil analysis and dairy products quality control. It was also an opportunity to meet some winemakers including a customer, already user of the CDR WineLab® for wine and must analysis. Analyzers CDR FoodLab for edible oils and fats presented to Lebanese Food Industry was last modified: May 25th, 2017 by CDR s.r.l.